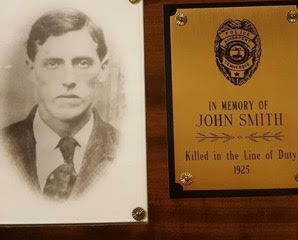 Patrolman John Smith and Deputy Hubert Webb, of the Sullivan County Sheriff's Department, were shot and killed as they and another officer attempted to arrest a fugitive. The suspect was wanted for murdering Deputy Sheriff Murdock McIntosh, of the Greene County, Tennessee, Sheriff's Department, on December 24, 1924. As the officers approached, the suspect opened fire, fatally wounding both officers. The suspect was apprehended and later died while serving his sentence in a penitentiary in Parchman, Mississippi.